UP Primary Teacher Vacancy 2018 Upcoming jobs of 69,000 Assistant Teacher Recruitment. Apply Online For UP 68,500 Teacher Vacancy 2018, UP 95,000 Shikshak Bharti 2018 for TET Pass, B.ED, BTC Pass. 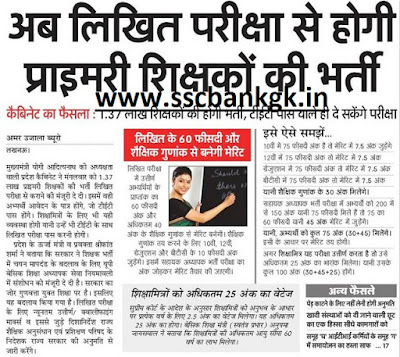 UP 16460 Junior Recruitment News for BTC Shiksha Mitra UP 12460 Primary Teacher Vacancy 2018 basic Shiksha Parishad Latest News. UP Primary Teacher Vacancy 2018 in hindi For D.El.Ed 68500 Vacancy application are invited under two posts sahayak adhyapak and urdu teacher. from official website upbasiceduboard.gov.in Online Application will be recieved from applicant who are UP BTC holders.Their merit list is made on their marks or written is also organized. district wise All vacancies should be filled in Uttar Pradesh. 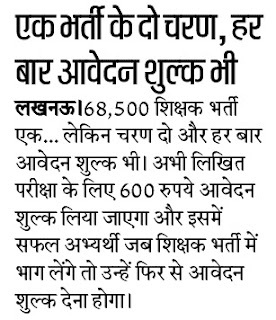 UP 69,000 Assistant Teacher Recruitment 2018: 69000 Primary Teacher Vacancies will be intimated from 6 December 2018. 20 December is last date of application registration. Basic shikshak Vibhag completely disclosed UP Shikshak Bharti Time Table of 69000 vacancies. 12460 Teacher Vacancy Latest News Today: On 2 November Court has given decision on 12460 Teacher Bharti will be cancelled and in three month new advertisement should released on this 12460 posts. TET Result : 10 December 2018. Form Opening Date: In December 2018. BTC 4th Semester Exam Date: 1 to 3rd November 2018. 26944 Left Teacher Vacancies: Prabhat Kumar who holds important posts in Teaching department said about 26944 vacancies that we will take decision on it. UPTET Exam Date: Exam Date of UP Teacher Eligibility Test is on 18 November 2018. Now Candidates can wait for upcoming. UP B.ED: Latest News 5 October Allahabad High Court has order and provides to be eligible in 95,000 Teacher Recruitment 2018. B.ed Bachelor in Education in which they can give their minds to the class of 6th to 12th Class. Latest Update Daily UP 68,500 Shiksha Bharti related problem come in Ligh and on monday special committee will present documents on primary teach. 1. Many Candidates unable to pass due to not give correct marks. 2. Now Many successfull candidates joining certificate stopped due to verification. 3. Many Copies were changed and answer also changed. 4. Number were given on cutting and over writting. 95,000 Primary Teacher Bharti 2018:- Latest News of 14 August after declaring result of 68500 Basic Shiksha Vibhag said we in November take TET Test and also give the advertisement of 95,000 Shikshak Bharti in January 2019. Highcourt has not given order to decrease the cut off marks below 40%, 30% Percent of OBC, SC ST candidates. UP Primary Teacher Twitter Account:- BED TET Pass candidates from various district in Uttar Pradesh twitting from twitter account of CM Adityanath Yogi, Basic Shiksha Mantri Anupama Jaiswal and also tagging message to Basic Shikha Vibhag sachiv. Upper Mukhya Sachiv Doctor Prabhat Kumar said in Twitter account," we are evaluating Answer copy as soon as possible. Result will be published on track soon. Note:- Before 10 August result may be not published. 18 June Sanshodhit Answer Key 2018. UP 4446 TET Pass BTC Online Application Form 2018:- To Make 4446 BTC candidates Chances in BTC 68,500 Vacancies UP Basic Shiksha Parishad again open the link to fill the form from 14 May 2018 before the last date of application 16 May 2018. UP 68500 Bharti Exam Date 2018:- Latest update 2 May 2018 It is proposed to conduct 68,500 Vacancy exam from 27 May 2018. However Government order again released to take new registration process from 4446 candidates who unable to fill form. Note:- Left candidates of 2017 pass TET candidates is 4446. UP 68,500 + 68,500 Primary Teacher Vacancy 2018: Latest News 9.03.2018 Good News for Applicant who are waiting for BTC Upcoming Vacancy in Primary School. UP Government said on 9 March that they will again put advertisement 68,500 Vacancies (1,27,000) in November 2018. So Both 68,500 + 68,500 will be according to result of UPTET 2018. 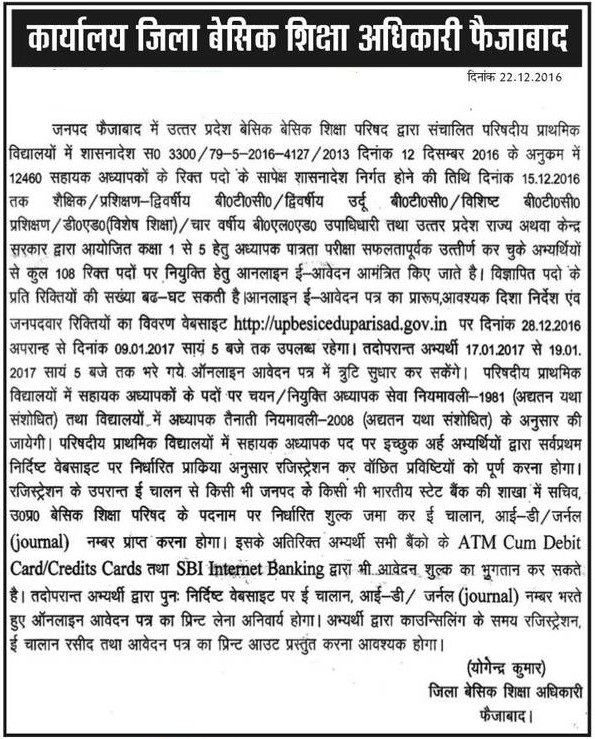 UP Primary Teacher Admit Card 2018:- On 12 March written exam conducted in 235 exam centers of 68,500 and applicant have to brin TET certificate, Last year pass certificate of BTC and aadhar card. UP 68,500 Vacancy 2018: Latest Update 10 February UP Teacher Online filling process completer and approx 1 Lakh 82,000 will fight in upcoming exam. is Many candidates filed case to remove the 45% Marks criteria which is mandatory in written exam of 68,500 vacancy.1 Lakh 50 Thousand candidates now applied. Assistant Teacher (Sahayak Adhyapak) in Higher Secondary School: 5390 posts. Class 1 to 8th vacant posts: 1, 74, 726 posts is vacant (released on October data). UP Assistant Teacher Result 2018: Exam Regulatory has changed the date of written exam result from 30 April to 15 May 2018. Educational qualification details for basic shiksha news Candidates must possess CTET/ UPTET/ BTC/ VBTC/ Urdu BTC/ B.ED degree from any recognized university or institute. Age limit for 12460 teacher vacancy in up– Candidates age should be above 21 years and below 35 years. Relaxation in upper age will extend as per government of Uttar Pradesh norms. 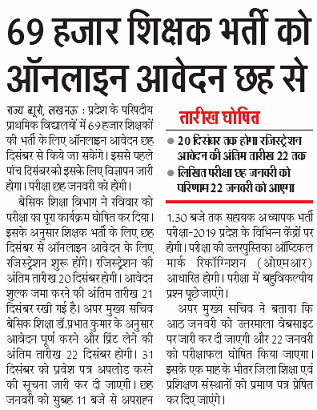 Selection procedure as per today uptet news in dainik jagran – Candidates will be selected on the basis of uptet Merit List. 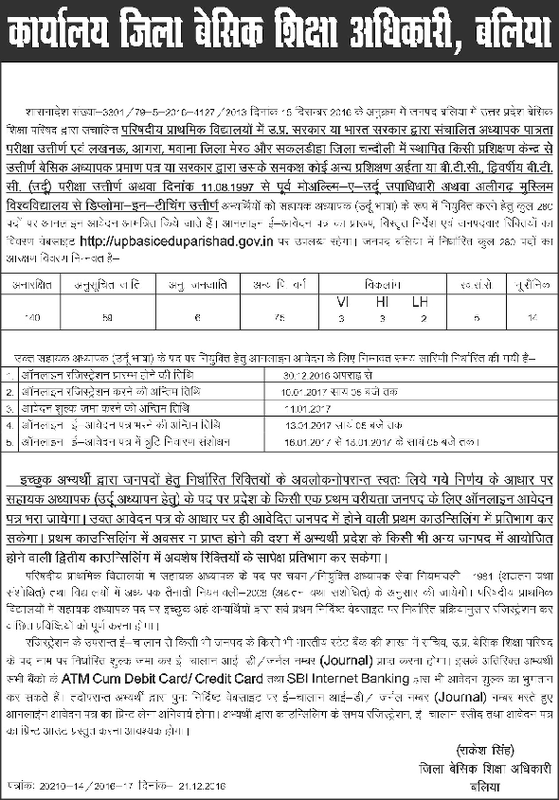 How to apply – All eligible and interested candidates who fulfill the eligibility criteria can apply online by Uttar Pradesh Basic Shiksha Parishad official website on or before 29th May 2013. 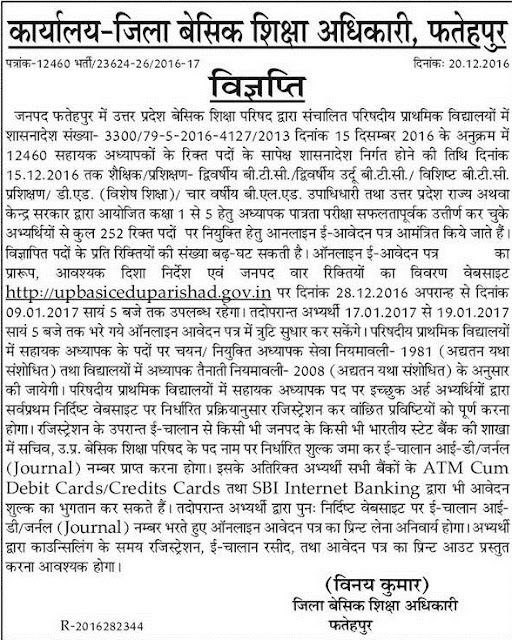 Online application form should be filled at upbasiceduparishad.gov.in. UP Primary Teacher Video Conferencing 2018:- On 24th May may officer will hangout through video conferencing for conducting written exam of primary teacher that will held on 27th May 2018. UP 12460 1st Counselling Selected Candidates 2018:- On 20th April it is advice to reach on 23 April 2018 Monday only to those aspirant who have attended 1st Counselling in previous.With Document & Certificate you may visit because after counselling board will not see your matter. UP 12460 Teacher Counselling 2018:-From 23 April Selected candidates must visit important document to give verification and joining letter will be distributed on 1 May 2018. However 2nd counselling will also be organized if posts unable to fill. 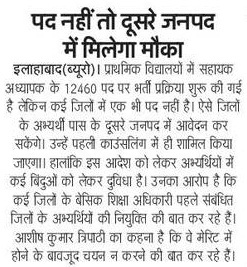 UP 12460 Primary Teacher Latest News 2018:- Before 15 June 12460 Primary teaching Joining will be completed. Ir is said by High Court on Latest hearing to recruitment 12460 Primary teacher recruitment through merit List.Check Latest News update 12 April 2018. UP 12460 Primary Teacher Vacancy 2018:- Latest News 17 March is UP Government has sent proposal to recruit 12460 Primary Teacher bharti which was stopped from 2016. Many BTC applicant suffered injury after protesting in Lucknow Vidhan Sabha. Latest News 22 January in UP 68500 Teacher Recruitment process two types of fees taken rule is available 1st is for exam and 2nd one is who got selected. 12460 Teacher Bharti: 1st Counselling is completed For recruitment process in primary school. 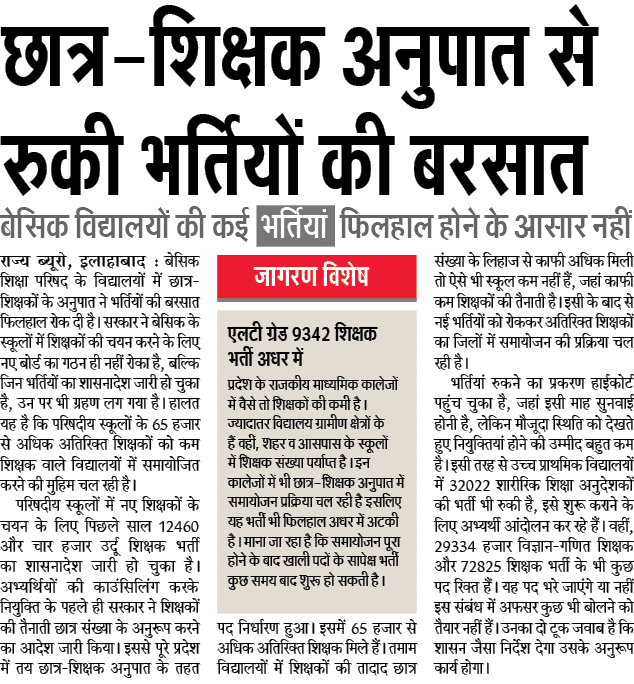 4000 Urdu Teacher Bharti: 1st Phase Counselling now started. 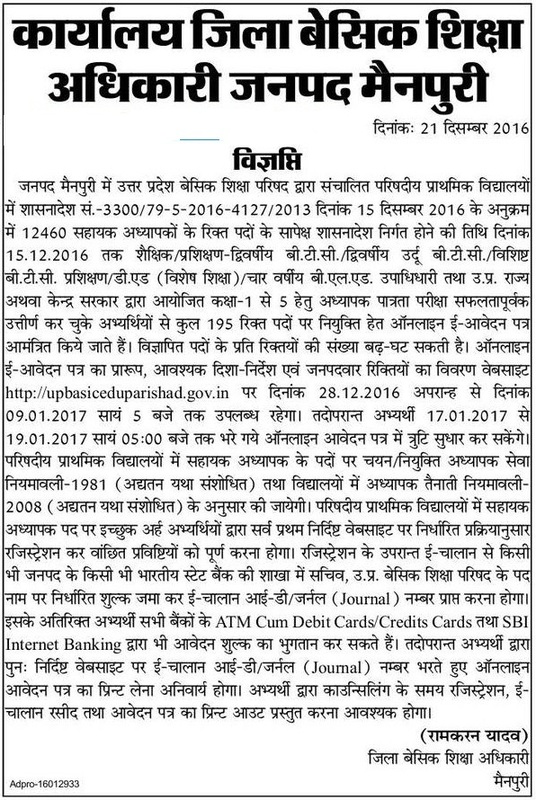 32022 Anudeshak Bharti 2017: Time Table Scheduled for counselling started in april. 9668 LT Grade Teacher Bharti. 29334 Maths Science Teacher Recruitment: Counselling and Joining process is started in March. 72825 Shiksha Bharti 2017: thousands of posts are vacant now. Many Shiksha Mitra applicant visited Allahabad High court to stop 68,500 vacancy because supreme court stopped 1 lakh shiksha mitra recruitment process. Finally Notification comes and apply online link will be available from 25 January 2018. After UP Board exam candidates will attend written exam on 12th March. 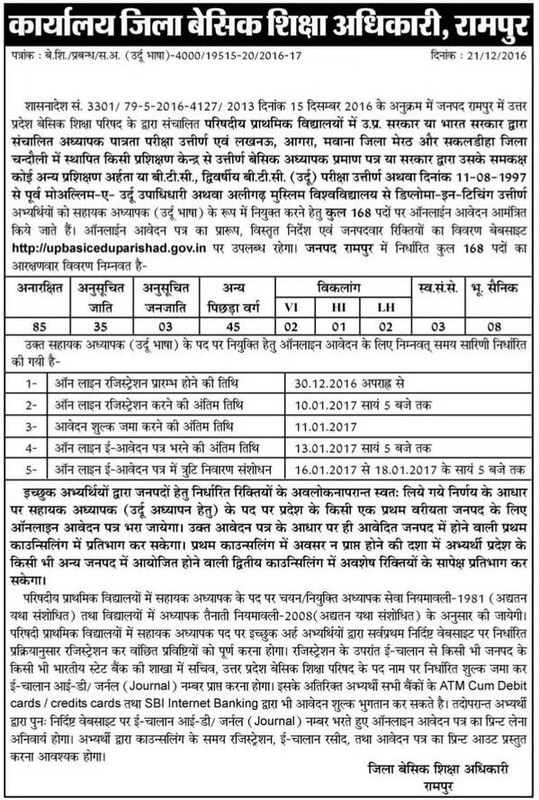 UP Assistant Teacher Recruitment 2017: On 4 November Allahabad High Court has removed the bank (Rok Hata Li) all recruitment process of Assistant teacher. Many candidates who are going for 12460, 4000 and 29334 counselling process. will soon get appointment letter, inform soon. 68,500 Teacher Vacancy News Today: Latest Update 30 October from November it is expected to release of 68,500 primary teacher recruitment in Madhyamik School and Degree college.A committee has decided to make new commission.For that purpose committee wants to combined Madhyamik Seva Chayan Board and Madhyamik Shiksha Sewa Ayog. UP Sahayak Adhyapak Bharti 2018: Latest news 25 October state govt spokesperson and health minister Sidharth nath said in a cabinet meeting for upcoming 68,500 sahayak adhyapak bharti in up along with 27141 paramedical vacancy. UP 68500 Teacher Vacancy 2018: CM Adityanath Yogi said to both UP Police and UP Teacher that no more wait for these 41,520 and 68,500 vacancies. All that come In December Last week, exam date will be organize for upcoming vacancy of 68500 teacher in primary school. And UP Govt has also given relaxation to DED Applicants of 2013 bharti in which 10,000 teacher recruitment process carried out. 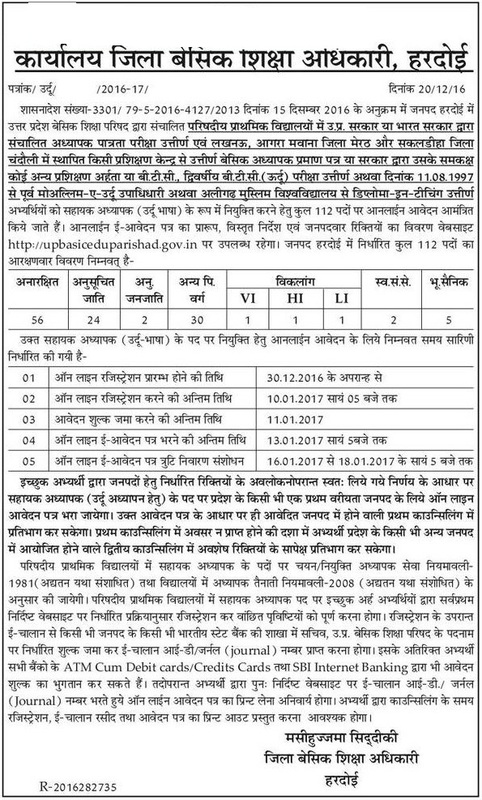 UP Teacher Upcoming Recruitment 2017: Total 1 Lakh 60,000 posts is vacant of Primary Teacher vacancy after sending information to central government 1,74,726 posts is vacant.Below we are giving up coming jobs in up government school in various posts. UP 12460 Assistant Teacher 4000 Urdu Teacher Upcoming News of 17.09.2017 : Now the Candidates of 4,000 Urdu Teacher or 12460 Assistant Teacher will have to attend the Written exam After giving TET (15 October ). We have given below latest image on conducting written exam. UP Madhyamik Shiksha Parishad Latest News 2017: On 5th July Latest Update UP Government said they have not stopped recruitment process but they soon making organizing or committee to start filling vacancy. On 31st May Primary Teacher Vacancy goes to Supreme Court and many candidates filed the case in Court to remove ban from 4000 Urdu Teacher and 12460 Primary Teacher. Candidates also said after new government cam they take stay on Uttar Pradesh Adhinasth Sewa Chayan Junior Assistant, Assistant Accountant, Auditor and Excise Constable. 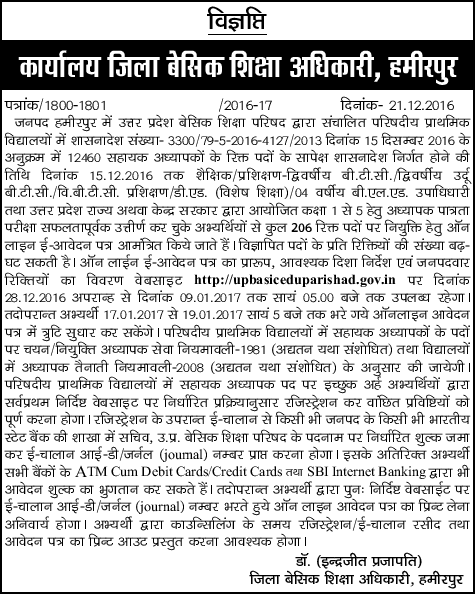 Basic Shiksha Parishad Latest News 2017: On 19th April It is good News for those applicant who want to become teacher in UP Government because Bumper Amount of teacher will recruit and Many candidates will employed. BSA have asked every district DIOS to tell them vacant posts of Sahayak Adhyapak. 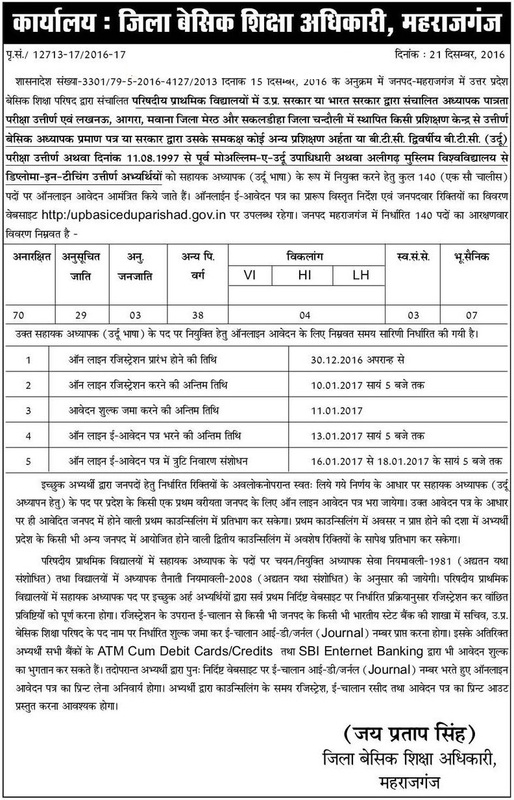 up (primary teacher) recruitment 2017 district wise detail: Latest update Madhyamik shiksha parishad will fill TGT PGT, Assistant Teacher (Sahayak Adhyapak Bharti ) in 90 Day. New minister shri Dinesh Sharma said they reviewing all posts which have cancelled now and publish again without any corruption.He also said they will soon distribute Laptop, Free books, Salary related problems etc. UP 29334 Assistant Teacher Hearing Court News 21 March 2017: High Court Lucknow Bench has stopped the Sahayak Adhyapaka bharti vacant seat after 2nd Counselling. Many candidates said that UP Basic Shiksha Parishad not follow the rules and Adhiniyam on 1994 ki Dhara 3 which is against Updhara 1 2 and 3. 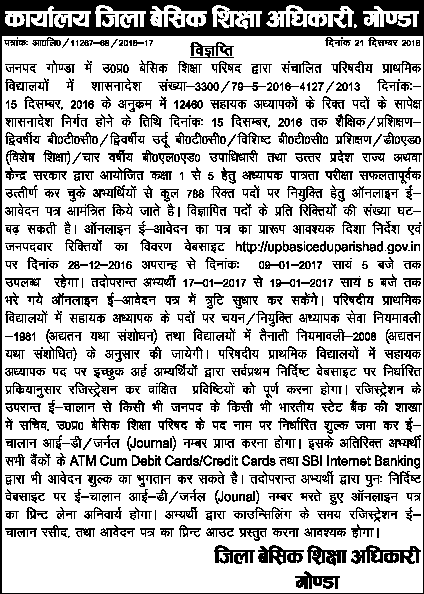 UP 12460 Counselling Letter 2017 : Latest Update 15 March 2017 UP Basic Shiksha Parishad has posted the time table of 4000 Urdu Teacher counselling and 12460 Primary Teacher Counselling to check date for seat allotment joining process you may check latest dainik jagran, hindustan news paper, amar ujala for update. 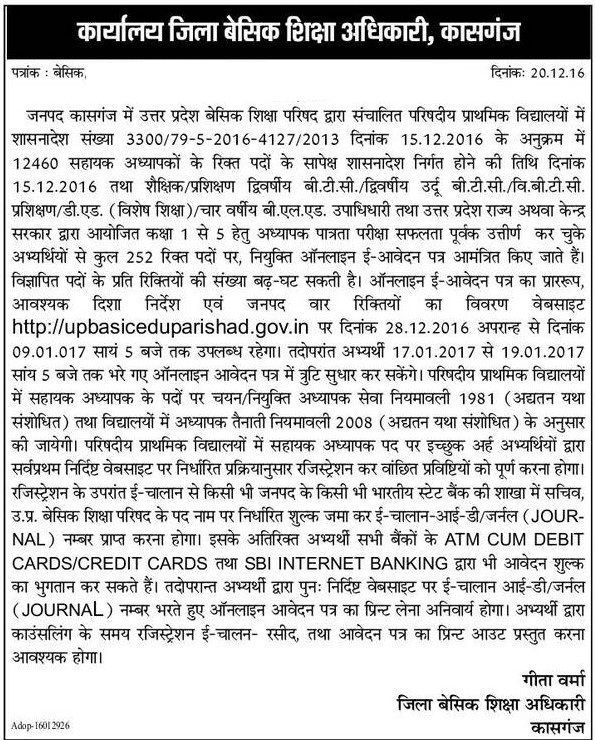 UP 16460 Counselling Date 2017: UP Basic Shiksha Parishad has published Notification for 4000 URDU Teacher 22 March, and 12460 Primary Teacher Counselling starting from 16 March 2017 for 12460 17th March Merit List of Selected candidates will get Joining Letter for Urdu Teacher 3 April and 12460 Primary Teacher 31st March handed over by 47 Jila Basic Shiksha Adhikari to Dainik Jagran, Hindustan Paper and Amar Ujala. 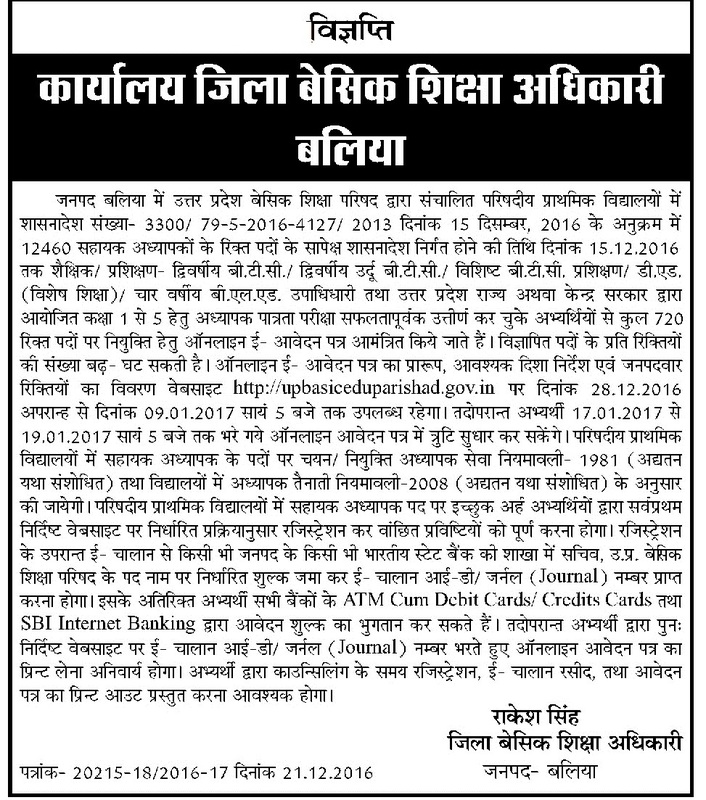 UP 12460 Primary Teacher Counselling Date: 18 March to 20 March 2017. 12460 Primary Teachers 2nd Counselling: 25 March 2017. Selected Candidates List of 2nd Counselling: 27 March 2017. 12460 Primary Teacher Joining Letter: 31st March 2017. Urdu Teacher 1st Merit List and Cut Off Marks: 17 March 2017, 18 March 2017 up to 21st March. 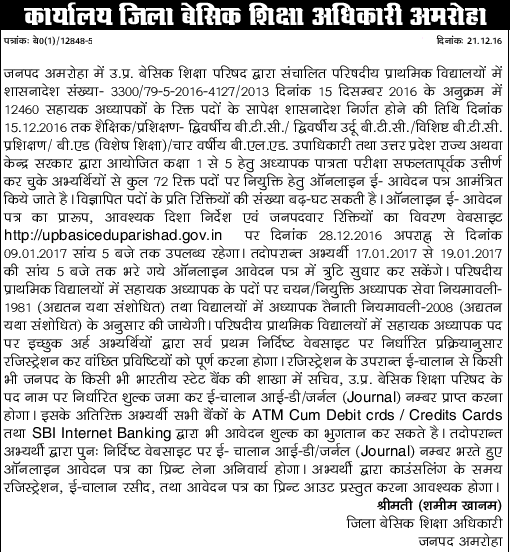 UP Urdu Teacher Counselling Date: 22 March, 23 March 2017. Urdu Teacher 2nd Counselling: 30 March 2017. Joining Letter: 3 April 2017. UP Government has made hat trick on Basic Shiksha Vibhag UP 1 Lakh Assistant Teacher, 37,000 Shiksha Mitra Vacancy , UP Police Bharti as well as UPPSC Civil Service Recruitment 2017. More than 2 Lakh vacancy in UP is pending under high court jurisdiction. 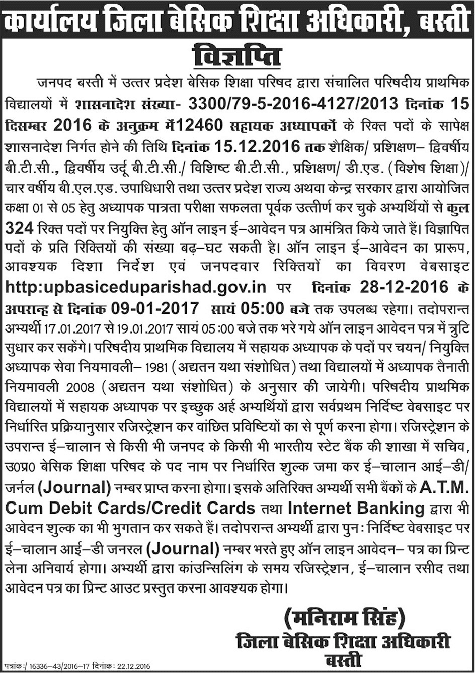 On 28 January 2017 Latest Update: Sanshodhan in 16460 Primary and Urdu Teacher Vacancy Basic shiksha parishad has given chance to all applicant who have applied and and leave some error on their UP Primary Teacher Application Form.UP 16448 Primary Teacher vacancy High court has said to recruit or fill vacant posts from other State also. 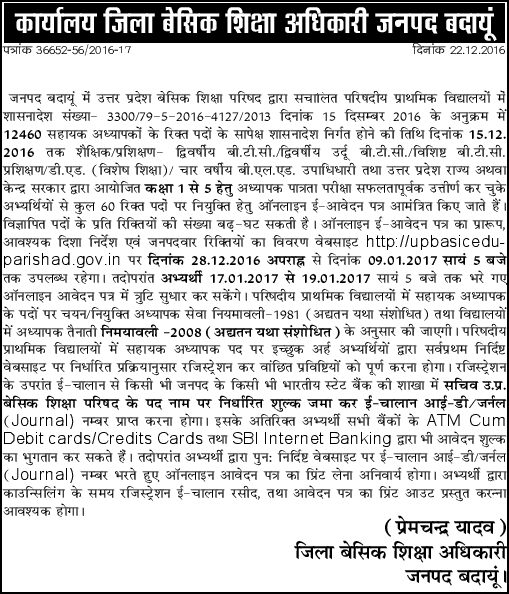 UP 16460 Correction Link & Date Latest Update 26 January: If you have applied for UP BTC 12464 or UP 4000 Urdu Teacher, DED, 4 Year BLED. Than UP BTC Primary Teacher correction link with last date updated. You can visit UP Basic Edu Parishad Official website for UP BTC Primary Teacher Correction Link 2017. Correction Link: "उ० प्र०बेसिक शिक्षा परिषदद्वारा संचालित परिषदीय प्राथमिकविद्यालयों में 4000 सहायक अध्यापक( उर्दू भाषा ) की नियुक्ति( 2016- 17)- सम्मिलित होने वालेअभ्यर्थियों हेतु "
Correction Link: "उत्तर प्रदेश बेसिक शिक्षा परिषद द्वारा संचालित परिषदीय प्राथमिक विद्यालयों में 12460 सहायक अध्यापकों की नियुक्ति ( 2016 - 17 )- सम्मिलित होने वाले अभ्यर्थियों हेतु "
On 24 January Basic Shiksha Parishad they will updated 14165 BTC Vacancy in upcoming month because BTC 2013 candidates has said to release 30000 Vacancy but BSA has said for opening 14165 vacancy in short period. Allahabad High Court said on Latest updated 21 January to Basic shiksha parishad to declare total posts in website of Teacher vacancy Government school, Finances School and self Finances in primary, junior high school and lt grade teacher level posts. 10000 Ded Teacher Recruitment 2017: 20 January Online form released for DED 10000 Sahayak Adhyapak Bharti. After 2 and the Half year basic shiksha parishad wants to recruit DED Special Education holders. 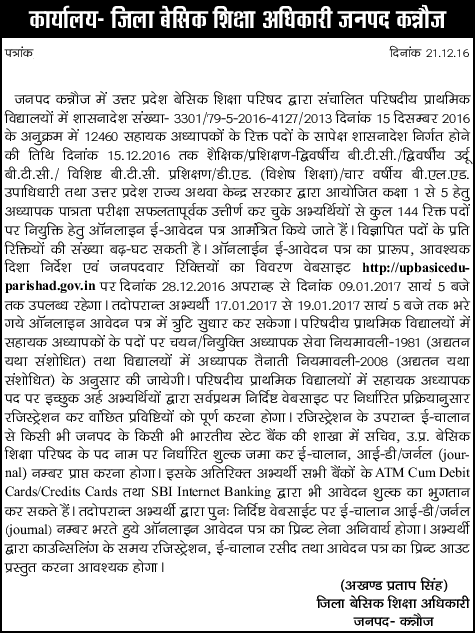 DED Teacher last date to for form 31 January 2017. UP 12460 Teacher Latest News from supreme Court: On 18 January To save their teacher Jobs many candidates has visited to supreme court. More than 1 lakh teacher have not got joining letter.In 4 years teacher vacancy (9770 , 10,800, 4280 Urdu, 10,000, 15,000 and 16448 ) in up is in danger under constitution act. Case Pending Between Teacher and Basic Shiksha Parishad: 16th Sanshodhan, 15 Sanshodhan. 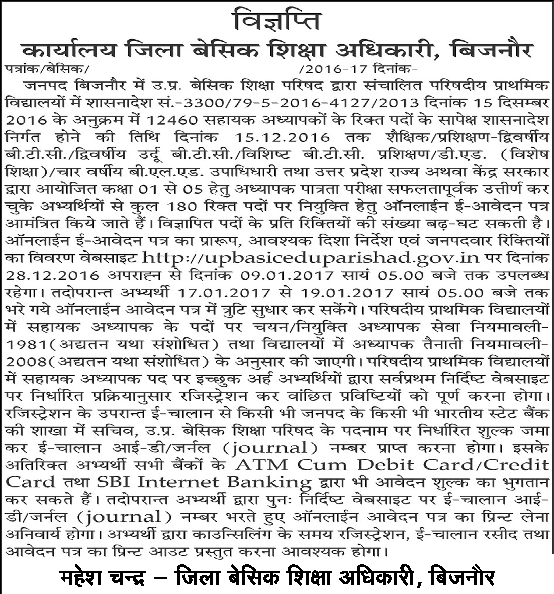 UP 12460 Teacher High Court News: On 13 January 2017 Shikshak Bharti in UP again goes to high court. Many candidates has said that according to 12th(Sanshodhan) rule of high court TET is compulsary for recruitment but UP Education Board not following this rule and using Basic shikha Niymavali of 15th (Sanshodhan) which is cancelled by High Court. 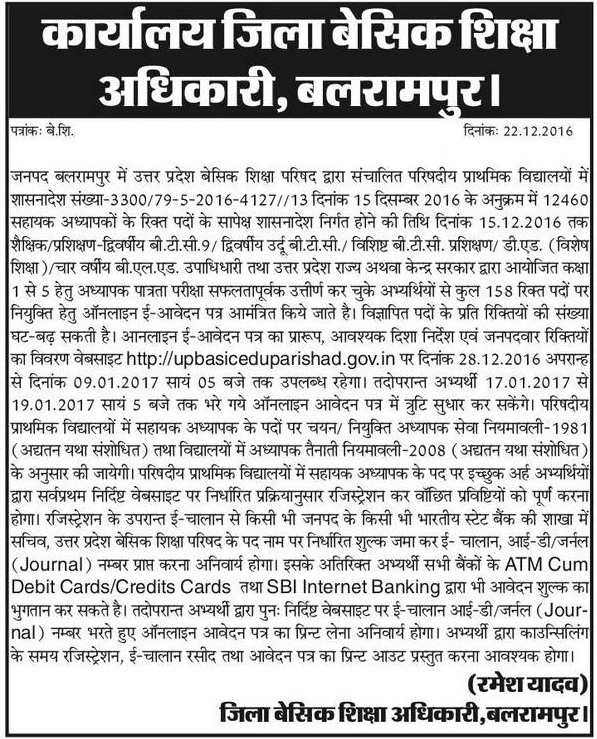 UP 12460 Assistant Teacher with Urdu Teacher News: On 10 January Last Date for 12460 Online Application has been Extended Up to 13.01.2017 and Correction of form will be started from 20 January to 27 January 2017. 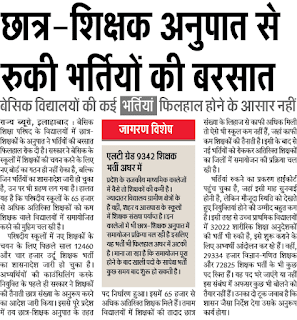 Now Many will get in New Merit list 1246 teacher vacancy because Allahabad High Court has given orders to include diploma holder who have degree of D.Ed & B.El.Ed holder. 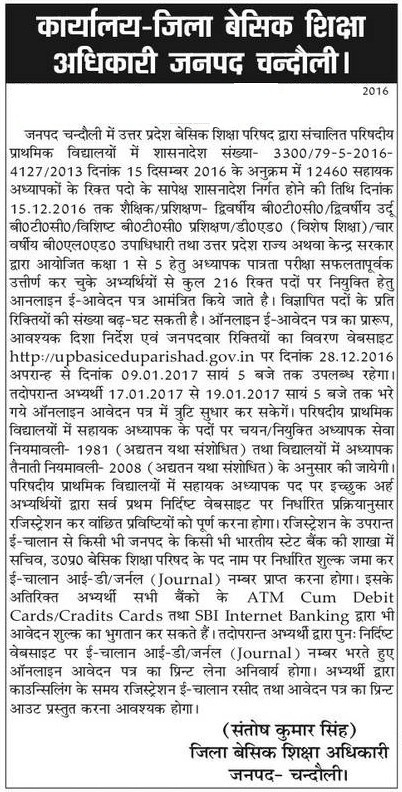 UP 12460 Primary Teacher Latest News: 2 January 2017 Those candidates will given preference, if their district assistant teacher posts is filled and other district are vacant. They are to attend the Basic Shiksha Parishad counselling with their UP 12460 Merit List 2017 Cut off Marks. 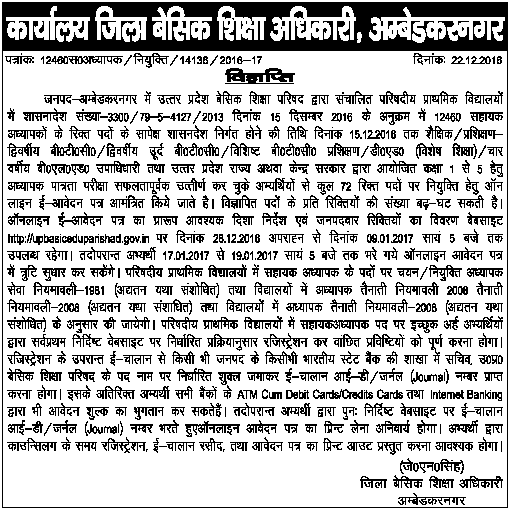 UP 16460 Primary Teacher Vacancy Latest News update 28 December 2016: We have updated primary teacher vacancy district wise from UP BTC Assistant Teacher Recruitment 2017 in Primary Schools 12460 BTC and 4000 Urdu Teacher Total 16460. 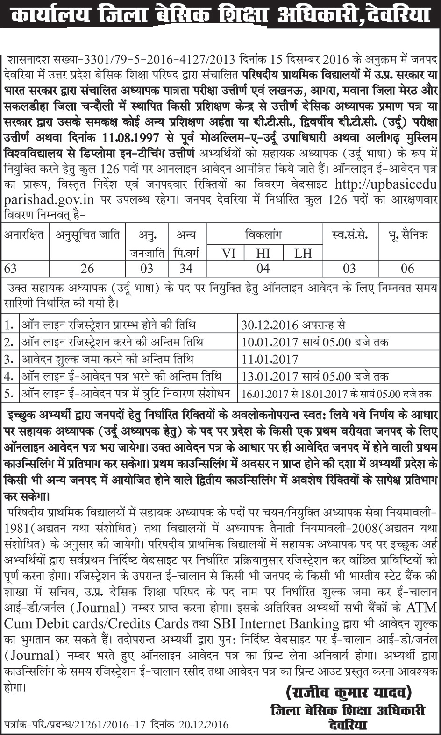 UP Basic Shiksha Parishad Assistant Teacher Recruitment 2017 is available to all district of Uttar Pradesh. 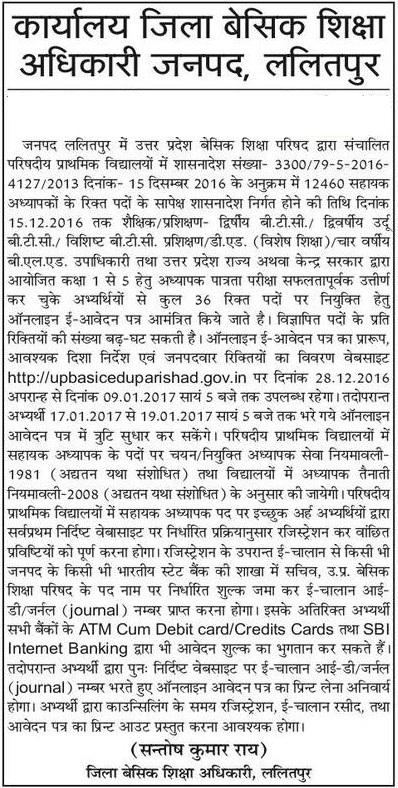 UP Assistant Teacher Recruitment 2017 Latest News Update 15 December 2016. UP Basic Parishad has given notification for UP 16460 Primary Teacher Recruitment and 4000 urdu teacher vacancies.Earlier government has decided to recruit 14165 but today revised vacancy 16460. 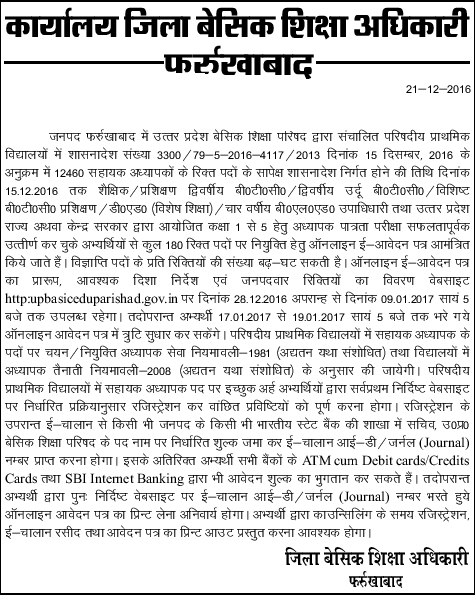 UP Primary Teacher Latest 2016 sarkari News on UP BTC 12000 Teacher Recruitment 2016 In Uttar Pradesh Disricts BTC 2013 2014 people and B.ed candidates. 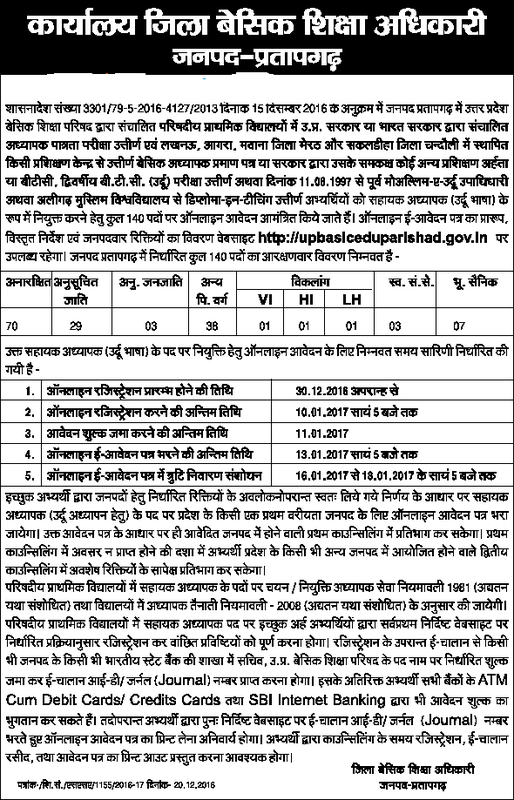 UP 12000 Primary Teacher Recruitment 2017 Prt. ke liye online registration soon starting with Urdu teacher. UP 12000 Primary selected through UPTET Rank List 2016 and 2015. 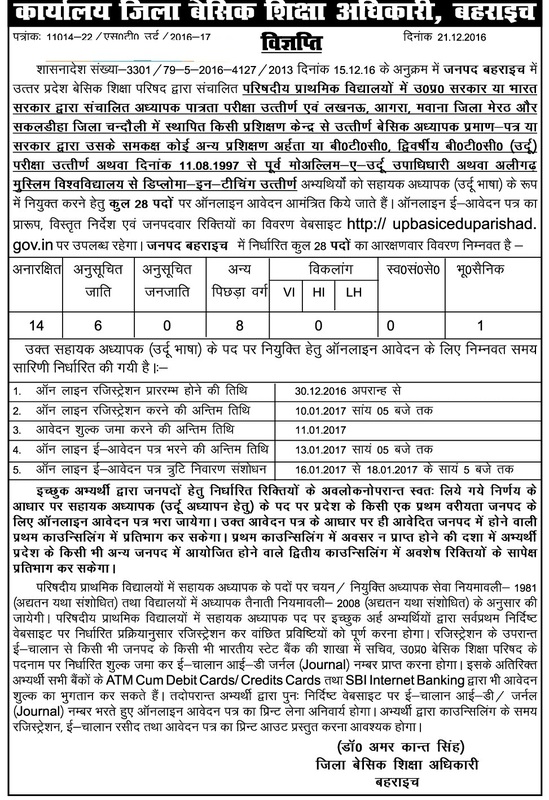 UP 10000 LT Grade Teacher Recruitment 2016 jaari After 2 years later the recruitment process of LT Grade teachers has been started. In 2015 the recruitment of teachers has been start. About 10 lakh candidates give application for 15000 teachers post. but because of post graduate problem the process has been stop. as soon as the merit should be made at the level of mandal and recruitment process should be start.